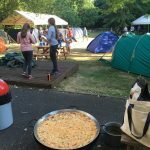 EKO 24 hour CampOuts offer the chance for all children to have an experience of camping. 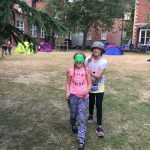 Many of our schools offer it to their Year 6s after SATS to ensure that all children leave the school having given camping a go and other schools offer a School Hall Sleepover if offering it to younger ones for a first experience at staying away from home. The CampOut is planned, resourced, risk assessed and led by an EKO leader with other EKO leaders and/or school staff as required to ensure an adult:child ratio of 1:8. 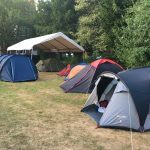 The day starts at 1030hrs with kit check, bed sorting (this could be tents or sleeping bags in a hut) and then after a quick introduction to the day and an outline of the rules the activities start. These could be bushcraft, team challenges, problem solving, natural art but all need to be completed before lunch around the campfire and then onto further fun activities. In the evening after supper, the children have time to toast marshmallows and sip hot chocolate around the campfire before heading to bed after their busy day. 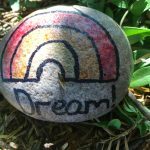 The following morning is a camping breakfast and a gathering together of kit and creations before one final activity and then parents collect at 1030hrs. A fantastic 24 hours when they will be challenged and changed both as individuals and as a group and it is something they will remember for ever. You can decide whether to hold the day at school or to bring the pupils out to one of our wonderful woodland areas. All children must provide their own weather appropriate, waterproof clothing and footwear and overnight camping requirements but we will assist with spares where possible.